A new season brings a while new set of challenges for Yukino, Yui and Hachiman. As the Service Club steps back into high gear, the club returns to their mission of helping the student body with their problems. What awaits the three friends this coming year? 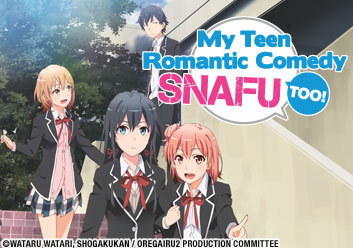 Find out in My Teen Romantic Comedy SNAFU, TOO! The Service Club's new task is to help Tobecchi find a way to confess his true feelings to Ebino, but she's got a different agenda in mind, and it includes Hachiman. The field trip in Kyoto continues, with the Service Club trying their best to help solve their problems. Later, Hachiman makes a surprising realization. The tension between Yukino and Hachiman is thick enough to cut with a knife. Meanwhile, Kaker is planning something for Hina. Hachiman ends up in an awkward situation with Orimoto, while still searching for the solution to the student election prank. However, a resolution is closer than he thinks. Hachiman has yet to figure out how to fix the student council president election problem. But a discussion with his sister finally gives him the ability to take action. After the student council election, Hachiman has his reservations as to whether he made the right choice as the new president struggles with her first event. Episode 7: Even So, That Room Continues to Play Out the Endless Days. Iroha’s first event as president isn’t going well. All of the people on the partnering student council just want to look smart, but can’t actually make decisions. After Hachiman and Yukino’s conversation, Hachiman is left contemplating the faults in his thinking. Ms. Hiratsuka offers him a car ride and her advice on the matter. Ms. Hiratsuka gives the trio and Iroha tickets a theme park and tells them to discover what Christmas really means. Episode 10: The Thing That the Light in Each of Their Hands Illuminates. It will take all three members of the Service Club to fix the disastrous Christmas event. After, Yui and Hachiman head out to pick a present for Yukino's birthday. Episode 11: Hayato Hayama Always Lives Up to Expectations. While the group attempts to figure out what their respective future plans are, a rumor is sparked regarding Yukino and Hayama that makes the whole school curious. Episode 12: Still, The Thing He Desires Is Out of Reach, And He Continues to Mistake What's Real. With the approach of Valentine’s Day, the Service Club is overwhelmed with requests regarding chocolate. In an attempt to solve the issue, Hachiman concocts a sweet plan. Episode 13: Spring Always Comes to Life Buried Underneath a Pile of Snow. An awkward visit from Yukino’s sister causes Yukino to spend the night at Yui’s. But when only Yui seems able to make up her mind, the Service Club may never be the same.